The scanners from Datalogics healthcare family are engineered specifically to fulfil the diverse requirements in the healthcare sector. Therefore, the Gryphon I 4400-HC ideally fits into demanding laboratory and hospital environments. Its sturdy special housing contains anti-microbial additives that prevent germs from spreading. It also resists daily cleaning with harsh disinfectants. The scanner is highly reliable and able to read the whole range of bar codes at high speed and omnidirectionally, even from mobile devices or monitor screens. In addition to barcode scanning, it can be used as a camera for special tasks, such as the capture of signatures and documents. 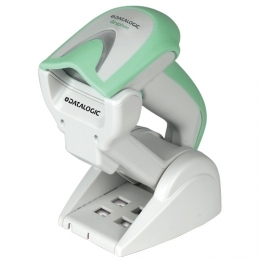 With its high motion tolerance, automatic change between handheld and presentation modes, automatic change between handheld and stand modes, aiming functionality and Datalogics patented Green Spot, the scanners handling is highly intuitive and increases productivity. Depending on the application area, choose between the cable-bound model, the Bluetooth version and those with 433 MHz radio technology. The Bluetooth model offers great flexibility, thanks to its 30 m radio range and storage of 1,200 codes in batch mode. With a special matching function, increase hospital patient safety, for example, with the administration of medication. With the Gryphon you are able to temporarily store a barcode and compare it with another barcode. Via this method no barcode is transmitted. If, for example, the value stored in barcode 1 in the patients record matches what is printed on the medicine in barcode 2, the Green Spot directly shows the scan confirmation on the barcode. This effectively minimizes the risk of confusion of patients and medications. Datalogic KBW cable - Cable, WYSE VDT 60/120/160/185/370, KBW, 4P, Telephone Connector, Straight, CAB-373, 6 ft.
Datalogic RS232 cable, coiled - Powered RS232 scanner cable, 9pin female connector, coiled, suitable for all Datalogic handheld scanners with serial RS232 output - no power supply needed! Datalogic Scanning RS232 cable, straight, 9pin - Cable, RS-232, 9P, Male, Beetle POS, Straight, CAB-389, Power Off Terminal, 6.5 ft.